Step 1: produce free oxygen atoms from molecules of rock. Maol wrote: he likely scenario for the origin of water is the solar wind contains H+ ions and O- ions and the twain shall meet. Well, I got the polarity mixed up, but I meant O ions. A substantial amount of the matter entrained in soar wind and CMEs is atoms other than H and He. 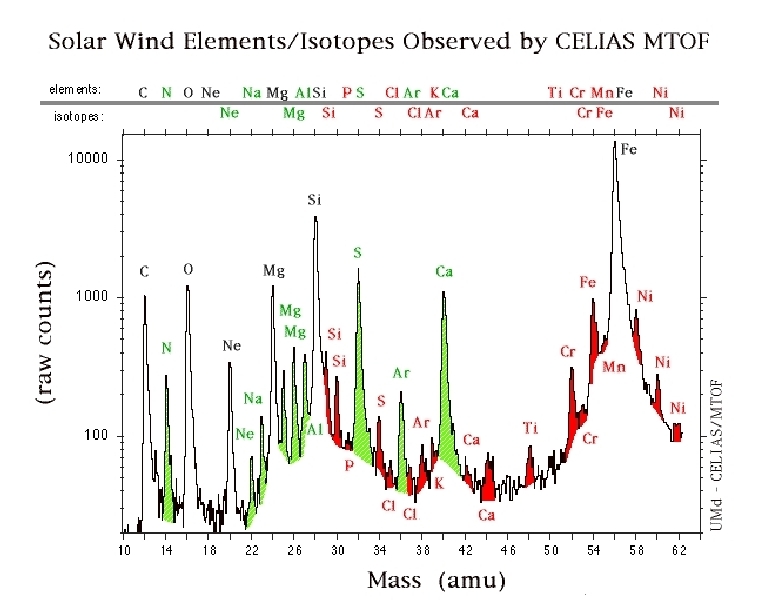 About 3% of the solar wind is positive ions of the composition shown in this image. About .75% of the solar mass and ejecta is Oxygen. Some data from SOHO. Search for the word oxygen in this. There are several mentions of oxygen in the SW and CME's. Maol, That ESA link seems to be coma-tose ? seasmith wrote: Maol, That ESA link seems to be coma-tose ? I don't know why the link didn't copy, there must be an inadvertent space added in it. This is "The First Results from SOHO" in which a search for Oxygen yields 10 returns. UVCS <--- Image links you can follow in the above link to the SOHO report. (Below is from the SOHO report ESA Bulletin Nr. 87. Figure 9. These images obtained by SOHO's Ultraviolet Coronagraph Spectrometer (UVCS) are the first of the extended corona in the ultraviolet. They are of atomic hydrogen (a) and highly charged oxygen (b), which flow out of the Sun along with other atomic particles to form the normal-speed solar wind. This material is shaped by the Sun's magnetic field into a giant nozzle called a 'helmet streamer', which extends over 3 000 000 km from the visible edge of the Sun. UVCS has determined that the particle velocities reach 100 km/s at the tips of these structures. Since the start of its observations in late January of this year, UVCS has made the first ultraviolet images of the extended solar corona above two solar radii from the centre of the Sun. It has sensed the presence of a broad range of chemical elements in the extended corona, and it has actually measured the speed of coronal material as it is accelerated away from the Sun. UVCS has confirmed that protons and the more massive oxygen particles are hotter than the electrons in the outflowing coronal gas. This temperature difference may be the key to identifying the physical processes responsible for solar-wind acceleration and for controlling the composition and temperatures of solar-wind particles near the Earth. UVCS has made the first measurements of the speed of highly charged oxygen as it flows out of the tips of streamers (Fig. 9b) and has also made the first measurements of the supersonic outflow of highly charged oxygen from coronal holes. This information is being used to test theoretical explanations of how the solar wind is accelerated. On 2016 July 03, comet 67P was at a distance of 3.32 astronomical units (au) from the Sun, outbound from its perihelion passage on 2015 August 13. Rosetta was in a close orbit about the nucleus, at a distance of 8.5 km from the event. The ESA team saw an "outburst" of "dust". Who is able to see the impact of an electric discharge? Daily recurring dusty plasma phenomena at sunrise on comet 67P? Electric solar terminator? The atmosphere of Rosetta's comet 67P/Churyumov-Gerasimenko is far from homogeneous. In addition to sudden outbursts of gas and dust, daily recurring phenomena at sunrise can be observed. In these, evaporating gas and entrained dust are concentrated to form jet-like structures. And the article goes into comets surface geology. this may be just the usual GiGo! Manipulating and backcaculating the initial conditions for the computer modelling after the wanted outcome. MattEU wrote: Daily recurring dusty plasma phenomena at sunrise on comet 67P? Electric solar terminator? However, it would be interesting to explain by exact physicists terms how such a hypothetical landslide may occur, when the gravitation on 67P/C-G is merely 1/100000 of that on Earth. Pretty well proving the EC model. Any one be able to help me with some math? sol88 wrote: Any one be able to help me with some math? Recently, while going through some books I had stored away, I found an old book, Manual of Astronomy, from 1909 by Charles A. Young, Ph.D, LL.D., late of Princeton University. As to the cause of luminosity, it is practically agreed that it cannot be due to any general heating of the mass of the comet, of which the mean temperature, on the contrary, is probably extremely low. The explanation now most favored attributes the light to electric discharges between the solid (?) particles through the gases which envelope them, -discharges due to the inductive action of the sun on the "cometic" cloud rushing towards it from regions of space, where the electric potential is presumably different from that of the sun itself. At present...there is not any known reason for assuming a uniform electric potential through all space. Apparently Astronomers in 1909 were more knowledgeable about comets than today!